General view inside the stadium before the match. 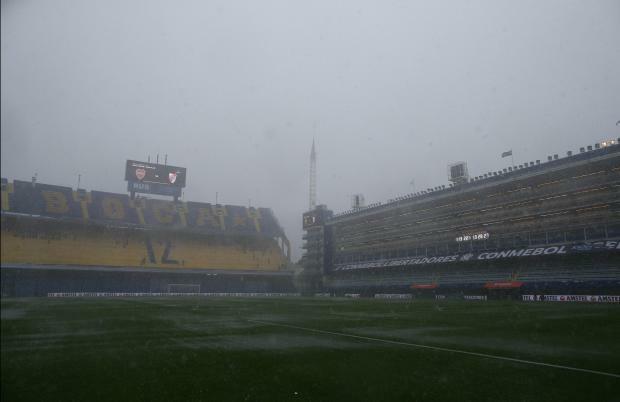 The final of the Copa Libertadores, the first in history between Argentina's two biggest clubs Boca Juniors and River Plate, was postponed for one day on Saturday due to heavy rain, the South American Football Confederation (CONMEBOL) said. The match, due to played at Boca's Bombonera ground, will now take place on Sunday, kicking off 5 pm local time (2000 GMT), CONMEBOL said. Torrential rain hit the Buenos Aires area throughout Friday and Saturday and the pitch was waterlogged and unplayable, officials ruled. Photographs showed the playing surface covered in pools of water as the rain continued to fall just a couple of hours before the scheduled 4 pm kick off time. The sold-out fixture is one of the most eagerly anticipated finals in the competition's history, pitting the two rivals against each other in the final for the first time. Boca have won the Libertadores, South America's equivalent of the European Champions League, six times, to River's three.